He’s running out of time, and he knows it. 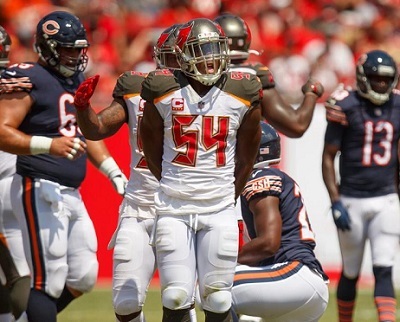 Seven seasons have passed since Lavonte David first burst on the scene, roaming sideline to sideline as a weak-side linebacker for the Buccaneers. Most of those years ended in frustration, both personally and collectively. With only one Pro Bowl on his resume, David enters the 2019 season seeking league-wide recognition at the age of 29, even as he transitions to a new position. Tampa Bay is expected to shift into a 3-4 base defense under Todd Bowles and David will move inside for the first time, perhaps next to a rookie linebacker like Devin White or Devin Bush. Buc fans are still waiting for David Unchained, a throwback to the glorious 2013 season when he registered 145 tackles, 21 for loss, 7 sacks, 13 QB hits, 5 interceptions and 2 forced fumbles. He was a one-man wrecking crew, playing with an edge after opening the year with an egregious late hit against the Jets that led to a bitter last-second setback and set the tone for a 4-12 season in Greg Schiano’s finale. David set a very high bar for himself as a second-year player, earning first-team All-Pro honors and evoking memories of Derrick Brooks, a Hall of Famer and one of seven Buc Pro Bowl linebackers in franchise history. Somehow, David didn’t receive enough Pro Bowl support that monster season. A last-place finish didn’t help his cause. The rest of the NFC South is usually lauded for quarterbacks Drew Brees, Matt Ryan and Cam Newton, but the linebackers in this division aren’t too shabby, either. Luke Kuechly, Deion Jones and Demario Davis are studs and Bruce Arians plans to turn David loose this fall. “Let’s see what he can do in a situation where we’re rushing him more, with his speed,” Arians says. Slated to be an unrestricted free agent in 2021, David posted nine interceptions in his first four seasons but has added only one pick in the past three. He’s annually selected as a defensive captain, but David leads primarily by example. He lets his play do the talking and he showed up rather loudly in the biggest moment of his career– when the 8-5 Bucs traveled to Dallas in 2016 with a 5-game winning streak and their playoff destiny in their own hands. The Cowboys won 26-20, despite 9 tackles, a sack and a fumble recovery by David. That season marks the only winning slate for No. 54 and he realizes time is growing short. Although David’s only Pro Bowl berth came in 2015, he has led the Bucs in tackles in six of his seven pro seasons. Last year, he ranked fifth in the NFL with 94 solo stops. That number figures to rise if he is assigned to patrol the middle of the field. Tampa Bay’s collapse after a 2-0 start still haunts David. A brutal defense improved slightly after the dismissal of Mike Smith, but Bowles has a big job ahead of him. Time for a new chapter. Time for a fresh start. Time for the old Lavonte David. Ira Kaufman began covering the NFL as a New York Giants beat writer in 1979. He arrived on the Buccaneers beat in 1985, Finally, the corporate leash was removed from his neck when he joined JoeBucsFan.com in July 2016. The award-winning Ira Kaufman Podcast fires twice per week, and Ira’s columns appear thrice weekly, except when Ira is on special assignment. 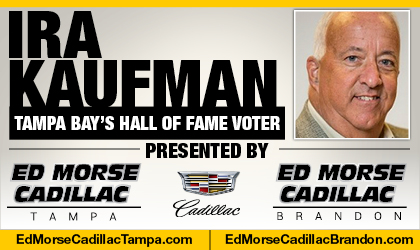 Tampa Bay’s only Hall of Fame voter also is a popular guest on various national radio shows and on local TV. He’s also co-host of TAMPA TWO at The Identity Tampa Bay, which returned to its regular format last month. Vinny Lecavalier is talking Lighting playoffs. How fun is that! It’s another great production from Joe’s friends at The Identity Tampa Bay. Agree out with the old in with the new that’s why stuffs like GMC need to go! He’s been a solid player throughout, dealing with an itchy trigger finger ownership group who apparently enjoys coaching searches. I’m all for admitting a mistake when its made but some of the talent we’ve had here has been put through the wringer way too many times. Its difficult to feel sorry for millionaires, I mostly feel for my brothers and sisters as fans having to find a way to remain excited when you realize some the wasted talent. Whether they are still here or we threw it out with a regime change. All that being said, I’m excited about the draft and mostly having a proven coach lead us out of Bucs Cove. I’d say one of the missing ingredients we had before Sapp, DB55, Lynch etc was Hardy ‘[email protected]’ Nickerson. That guy was a significant difference maker on our rise out of the original Bucs Cove. Single handedly changed the attitude on the field and gave fans something to cheer for, regardless if we won or lost. Miss that guy and the chant from the southwest corner of the end zone. HAAAAAAARDY….. HAAAAAAAARDY…..HAAAAAARDY!!!! Damn that was fun! I’d say one of the missing ingredients we had before Sapp, DB55, Lynch etc was Hardy ‘Freaking’ Nickerson. That guy was a significant difference maker on our rise out of the original Bucs Cove. Single handedly changed the attitude on the field and gave fans something to cheer for, regardless if we won or lost. JBF Team and Post Brethren, if my post doubles up, my apologies, my first time in moderation…..
and what sweet timing that is, because these coaches know what they’re doing. Probably about time for my man to go ballistic on the NFL (this time with the national spotlight) in hunt of a DPOY. He needs to make game wrecking plays and set the tone for everybody else. That’s the only type of attitude that will change this defense and being the player that I know he really is I expect it to come from him..
Yup. By my memory, the culture change in Tampa Bay began when the Bucs signed Nickerson away from Pittsburgh. Might as well move LVD to the middle, I know crazy talk, but lvd has had to train Foster, Kwon and lord knows who’s next. Beckwith seemed like the only true blue lb that had a clue how to play it. Foster too but he was a thumper the rest of his game was good but not outstanding if that’s fair to say. Kwon was playing out of position the whole time and it showed. The Teflon Kwon. Great article Ira … thanks. LVD has long been one of my favorite Bucs. Not a flashy or vocal leader, but he’s great at sniffing out plays. Greg Schiano was the only coach IMO who knew how to use him. 2013 was obviously his monster year, but he was very consistent in several categories (tackles for instance), until Smitty took over as DC. After that his stats clearly reflect that he was being used quite a bit differently in 2016-2018 than he had been (only 1 INT & 7 PDs total in 3 yrs for instance). I keep hoping that Todd Bowles will be able to capitalize on LVD’s talents, as well as the other talent we have on defense. And yet, the more I’ve looked at Bowles’ accomplishments, the more skeptical I’m becoming. Past 4 years as a Head Coach, not as a DC … sound like what Mike Smith brought to the table? His first year as the Jets HC, they did well defensively (his long-time associate, Kacy Rodgers, was his DC all 4 years there BTW). But after that, the bottom fell out and the team posted 5-11, 5-11 and 4-12 records in 2016-2018. The Jets defense ranked #28, 22 & 29 in POINT ALLOWED in those years. I keep looking for a ‘common denominator’ for why teams with the SAME coaching staff go from good to bad, and the only conclusion I ever come to is poor drafting and injuries (specifically Games Lost to Injuries). That killed the Bucs last year, and it appears that the same thing happened to the Jets. In 2015 (Todd’s 1st year as HC) the Jets went 10-6 and ‘only’ lost 153 Player Game Days to Injuries. In 2016 that increased to 242 games lost to injuries, and they went 5-11. In 2017 that rose even more dramatically to 322 games lost to injuries, and they went 5-11 once again. Ironically it fell way down to 152 games lost to injuries, but they got even worse, falling to 4-12 (looks to me like several years of focusing on offensive drafts finally took its’ toll). Wow, sounds eerily familiar. Hopefully Bowles has him running around the field with his hair on fire. I remember many of games in the Schiano/ Lovie era or error where the defense looks like it had given up but David was the only one making plays, he was the only one not giving up. You could see his will and determination. The sad thing is with that eventually it takes a toll, you get older, more banged up, and you want to preserve your body. I just don’t see how someone can keep up that effort with out much reward. Hopefully David has some miles left and that BA/Bowles can reignite that passion and will, not for just David either. Sadly these defensive players have been forced to play on their heels for years i.e. waiting to react. Finally they’ll be able to play defense on the balls of their feet attacking. What a refreshing sight it will be see a safety walk towards the los pre-snap. I recall in the Broncos/panthers Super Bowl seeing 0 coverage on a number of occasions. I’m like d$&@ now that’s aggressive. Every eyeball on the defense right up at los. Wade Phillips on sideline like “beat it cam”. He couldn’t. If you’re HC is does not exhibit an aggressive nature I wouldn’t expect that team’s players to look that way out on the football field. LVD is inching towards GMC territory…..very good player but not a true leader and winner…. Hard to be a winner with Jason No Light At the End Of the Tunnel Licht as GM. Fireeee Licht!